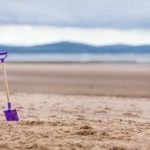 Are you looking for the best garden spade? 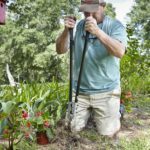 Are you tired of using an average garden spade for digging holes that doesn’t give you the proper utility? And are you looking for the cheap garden spade that gives you maximum satisfaction while digging, pierce hard, compacted and rocky soil? If your answer is YES for any of the above questions then you are in the right place! We review almost every garden spade available right now in the market and then select the best one only for you. We will also give you in detail guideline about how to choose the best garden spade and make the proper use of it. 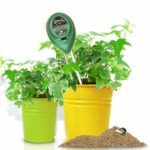 Below are the best garden spade reviews to ensure that you can pick the right one for your garden. This spade is made by a company called Spear Head Spade. It is a multi-patented hybrid tool. So, you can use it for both spade and shovel. Though it is a gardening tool you can use it in the field, base camp and outdoor as well. One of the great features of this product is reducing the efforts while digging. You can easily pierce hard, compacted and rocky soil. It is very lightweight and it has a very long handle. Longer handle helps to create great leverage. So, you can easily dig ling holes and also remove large plants. 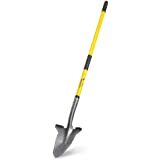 Even 60+ women can dig holes easily with this spade or shovel. This spade shovel is designed like a spare which enables you to do any kind of work easily. It is the most thicker and stronger spade shovel in the market available right now. But you will be amazed that the weight of the product is only 3.8 pounds. It also has footrests for exerting pressure and create extra leverage to get through anything you need to. 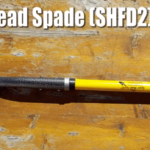 Watch the video below to get the full review of the Spear Head Spade Shovel. Guaranteed to significantly reduce digging efforts. Is the point of spade sharp or dull? What is the shovel/spade made of? 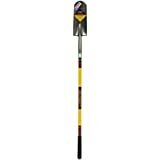 The Spear Head Spade has a high-carbon, manganese steel blade with a fiberglass handle and a polymeric cushioned grip. Can I use this shovel to dig a trench? Fiskars is a popular brand when it comes to garden spade, shovel, and trowel. 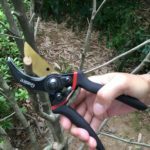 The most popular versions of Fiskars have a 46-inch steel D-handle and mainly have two kinds of shape, transplanting, and square. 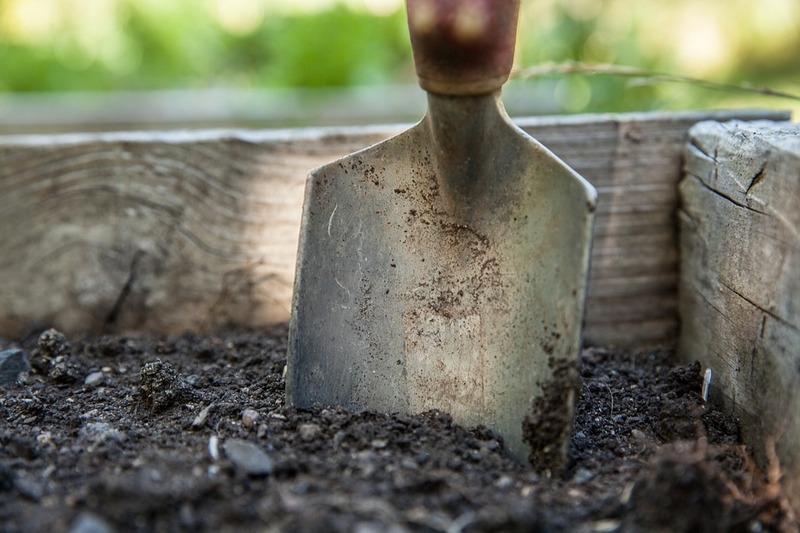 Transplanting spade is great for digging small and deep holes. It can also be helpful for other uses. The most popular versions of Fiskars have a 46-inch steel D-handle and mainly have two kinds of shape, transplanting, and square. Transplanting spade is great for digging small and deep holes. It can also be helpful for other planting needs. The entire spade is 4 feet long from top of handle to blade. The blade is no more than 6 inches wide and the length of the blade is 15 inches. The blade is pretty enough sharpened that you will need to trouble digging holes in your yard. The transplanting spade creates an approximately 5-inches. Watch the video below to watch different Fiskars spade and shovel. 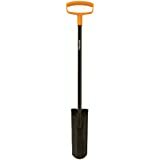 The Fiskars transplanting spade is full steeled construction. 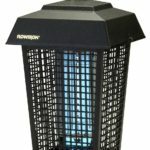 It is very durable and lightweight. The entire spade is powder-coated so that you can clean up easily. The D-handle provides great control and comfort. You can even make the handle of the spade short and long for some versions. You can use this spade for versatile uses and you also use it on your patio and lawn as well if you want to. This spade is slightly curved and it can be very helpful for replanting. Another great feature of this spade is it is backed by a lifetime warranty but you might not have any warranty against breakage. how long is it and what are the dimensions of the shovel part itself? The entire shovel is 4 feet long from top of handle to tip of a blade. The blade is 6 inches wide at the top with a 15-inch length. What is the digging width? About 5 inches. It’s a strong well-made shovel. 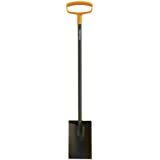 The Fiskars 46 Inch Steel D-handle Square Garden Spade is another great product of popular Fiskars manufacturer. 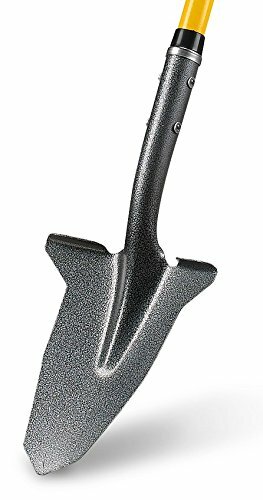 This spade is not great for digging but great for edging and cutting a trench. The blade is shape enough to penetrate tough soil or break up hardened dirt clods. This spade is much better at edging new beds or fixing old garden borders. This is much straight than the transplanting spade. The dimension of the product is 47 x 7.2 x 4.8 inches but the weight is only 4.8 pounds. It has a D-handle that helps to grip it easily and even you can use your both hand without hurting your hand. It also has an extra foot ledge so that you can use those to create pressure and easily apply your weight without hurting your feet. This is much straight than the transplanting spade. The dimension of the product is 47 x 7.2 x 4.8 inches but the weight is only 4.8 pounds. It has a D-handle that helps to grip it easily and even you can use your both hand without hurting your hand. It also has an extra foot ledge so that you can use those to create pressure and easily apply your weight without hurting your feet. The quality of the spade is welded and well made. All Fiskars spade is backed by a lifetime warranty and they all mostly use the same material which is steel. That’s why they are more durable. So, if you want to make your landscape looks great, this spade is a must tool that you should collect. Would this work as square faced transfer shovel, for moving lots of dirt, stone, or mulch? is the blade flat or rounded? 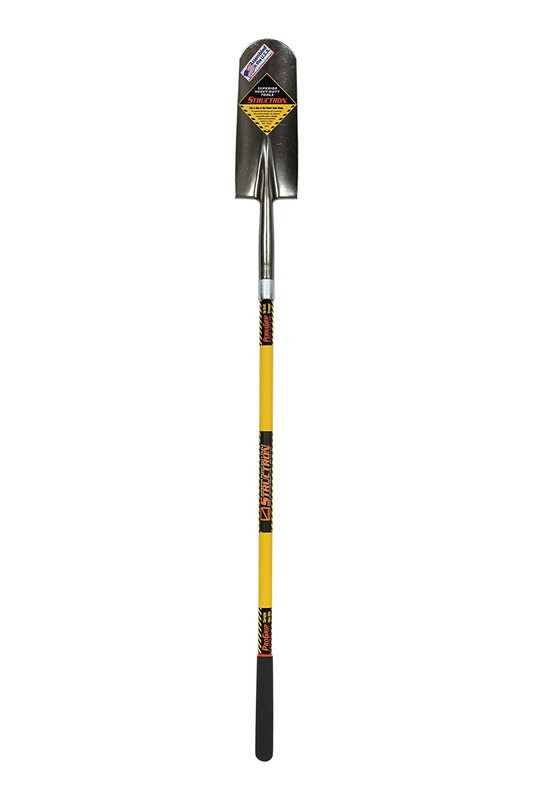 The Structron garden spade is one of the most heavy duty spades and it has 14-inch drain Spade with a 48-inch fiberglass handle and cushion grip. 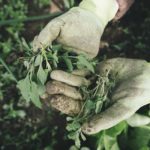 You can dig a hole, transplanting shrubs and can easily move soil quite easily. The blade is made of steel but the handle is solid fiberglass. 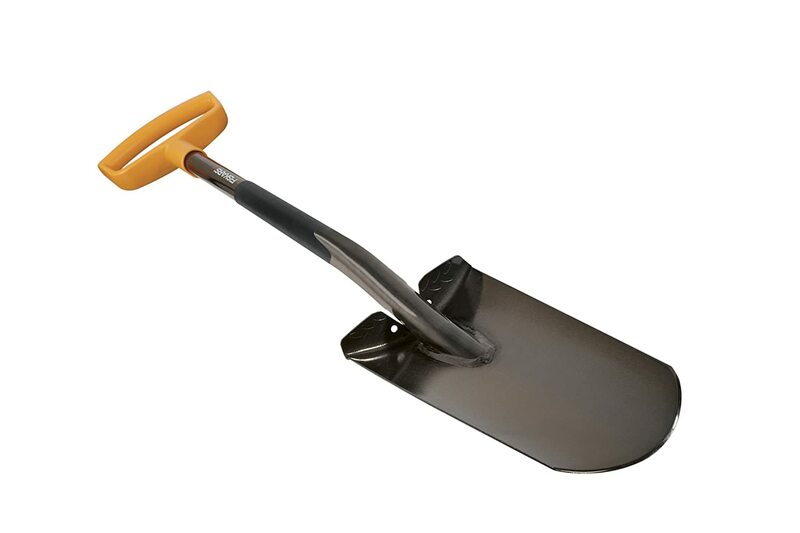 This spade is great for digging holes because it has a large handle. The larger handle is not only good for your back but also it is great for creating leverage and making the digging easy and fun. If you are trying to get a root-ball for transplanting, this spade might be a great option. The Structron garden spade has a limited warranty and it is a bit costly. The dimension of the product is 10.4 x 6.5 x 63 inches and the weight is 4.6 pounds. The spade is very durable and easy to use. What is the width (in inches) of the shovel blade? How ilong the handle is? 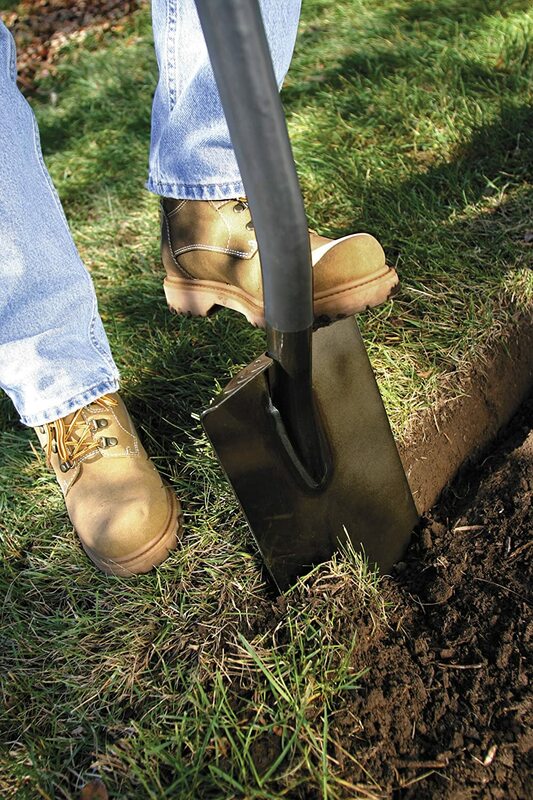 DeWit dutch digging spade might be a great tool for your garden. It is manufactured in Holland and DeWit is producing it for a long time. It has a boron steelhead and that’s why is very durable. The shape of the blade is slightly curved and sharpen enough to works great with all kind of soils. The dimension of the product is 45″ L x 2.5″ W x 6″ H and weight are only 4 lbs. 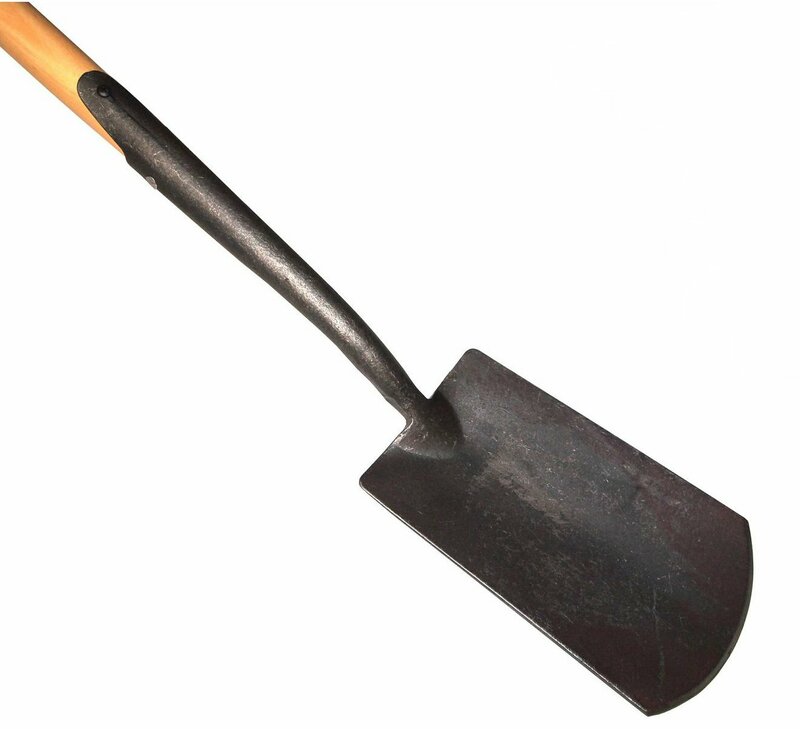 Though this spade is lightweight, you can use this tool for digging holes, bed preparation, planting and etc. It has a T-handle design that enables to remove stress on hand while using. Another great feature is it has elasticity and you can bend it without breaking. All DeWit tools made of Swedish Boron Steel. That’s why it is heavy duty but lightweight as well. The dimension of the blade is about 6″ wide and 10″ long. This is the perfect blade size for doing the digging jobs and planting as well. The tool is backed by a lifetime warranty. So, you can definitely buy it without any hesitation. what are the dimensions of the blade? 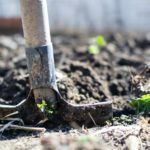 A garden spade is a very important tool whether you are a hobby farmer, garden supply business, or simply just looking for an easy hustle free way to dig, planting, bed preparation and so on. 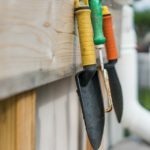 There are mainly 5 things that you should consider before buying your garden spade. Choosing the right garden spade is difficult but don’t worry, we have done the work for you. You should choose the garden spade according to 5 things mainly. 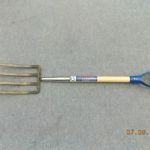 There are other things as well depending on the variety of garden spade you want to have. The material is the most important factor when choosing your best garden spade. Fiberglass is the material which is best. Steel is also good. When choosing the spade, you should see not only the material but also the brand as well. There are different brands whose spade is also made of steel but not last long. The material of handle is also important. The Wooden handle is old school practice now. Fiberglass handle is way better than the wooden handle and they break rarely. You should also look for the footrests in your spade. Footrests help to dig the soil quite easily. The blade is the most important feature when it’s come to spade. The curved blade is better than a straight blade. The width of the blade should be 6-9″ and the height should be 9-11″.You should choose a blade that is sharpened enough and after using it a lot of times it might get loose its sharpness. So, you should know how to sharpen your spade.No matter how good your spade is there is always a chance of losing the sharpness of your blade. There are lots of ways that can be used for sharpening your spade. Watch the video below to get just one idea of how to sharpen your garden spade. You can google and know other hacks of sharpening your spade. You can be creative and use your own ideas to make the space more usable and effective. 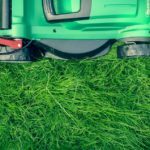 Warranty is another important factor when choosing your garden spade. You should always choose a product that has a lifetime warranty. You should also look at how there customer care service is as well. When your product is backed by a lifetime warranty, it will always give you a mental satisfaction. If you want your spade backed by a lifetime warranty you should definitely choose Spear Head Spade. There are other brands as well who also give you a lifetime warranty. Budget is an important factor when choosing the best garden spade. If you want a heavy duty and long lasting garden spade, the price of the spade will be a bit higher. But if you have a budget problem, you can have a cheap one which is less durable and might be heavy. Finally, how often and where you will use your garden spade is more important than any other things. 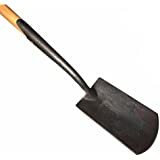 If you regularly do the digging, bed preparation or planting, you should definitely buy the best and lightweight spade. If you want to use the spade for mainly digging then you should buy a spade that has a rectangle and curved blade. On the other hand, you should buy a square blade spade if you want to use it for edging or cutting a trench. 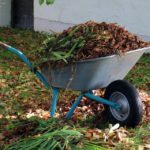 You should also know how to use a spade for digging in an effortless way. The longer the handle is it is easy for making a leverage and digging a hole. You should start digging from the center and then digging out straight back. You should also know the way of using the spade for landscape edging. Watch the video to get some ideas of how to use a spade shovel.